IG: Chris, we talked about the need to shift from objects and artefacts to systems in design and innovation for sustainability, cities being the new and necessary systemic focus. Let’s also talk about Victorian Eco-innovation Lab (VEIL) a bit. VEIL is known as a future-focused ‘design-research-engagement-action’ laboratory. Can you please explain what this means? CR: Right from the start of VEIL the changes in systems that we’ve been thinking about have been those changes which would mitigate CO2 emissions but also very strongly about resilience and adaptation. When we reflected on this, dealing with mitigation and adaptation simultaneously, the idea of shifting away from centralised systems of provision –energy, water, food, transport, information etc –, which have been the dominant ones in the last two hundred years or so emerged. These systems of provision resulted in ever-increasing production, ever-increasing distance of distribution of production, ever-increasing dependence of consumers as only consumers who are removed from any action in relation to production except from the current choice between brands. Instead, at VEIL we’re positing a networked system of provision with much greater localization and much greater diversity. This is the Internet model for production and we think it is potentially much more resilient; in fact that resilience is intentional. If one part breaks down the others can continue to work. The distributed model has a much greater social and cultural impact. We can begin to think about the future lives of cities where production and consumption is much more distributed across the city in all of the provision areas we talked about. Food was a dominant system in our research in early days. You can think about the fact that everybody is to some extent both a consumer and a producer; even if they’re not directly involved in production themselves, they understand the local nature of production. But we can do that in a networked way more effectively. VEIL started with this idea of exploring what would happen if in all areas of the provision of goods and services we moved to a distributed model. Without going into too much history, because the lab is 8 years old now, it started in 2006, the big shift over time has been to place ourselves within a university, at least within University of Melbourne. In Australian context VEIL is fairly unusual; it is a research lab, it has researchers who get research funding but really, VEIL’s position is not embedded in the university itself; it sits between the University and community. At VEIL, we’re interested in research which can be directly influential on changing conditions of engagement with the community in a process which is fairly open where we can say, “here’s what we think are the challenges for the future” and then work with communities to search for possible solutions and to generate other areas of research. But half the research we have now comes from the visions of the future generated in earlier projects. Our biggest success and strength has been to work out over time how to involve final year master students -broadly in the design, planning and engineering areas- in the work that we do. In a way that satisfies, more than satisfies actually, their educational program by getting them involved in not just today’s planning and engineering problems but also future’s. This gives us a huge force to work with; to engage with communities, to rethink how the future might be structured and to ponder how we might get there. So, VEIL is involved in design, research, engagement, action and teaching as part of a whole unified strategy to create change. IG: What are some of the projects VEIL is working on currently? Why do you think these projects are important? CR: Well, in that engagement space the most enduring program we have now is called eco-acupuncture. Eco-acupuncture is VEIL’s process of taking research and thinking about the challenges of the future, as well as some of the elements that might allow us to address some of these challenges into real communities and places; “precincts” typically of the size of ten thousand people where the challenges in terms of resilience, extreme weather and reducing CO2 emissions and so on are complex. Eco-acupuncture projects are not about changing buildings; they’re about life, they’re about the infrastructure of survival as well as the culture. We take our students and our research, go out into these precincts and we engage in a process of work with representatives of the community to think about alternative, much more distributed 25-year futures. We do try to resolve environmental problems as well as improve well-being, health and all of those other things. Then, on the basis of that work we try to identify interventions that the community can make now; many small scale interventions that might start to open paths to go in the direction of distributed futures. Over time we’ve understood that in the nature of that engagement process, it’s best if we take all university research and education out into the community. For this purpose, we set up a “shop”, a kind of design lab in somewhere terribly public in shops, disused schools, disused town halls, surf life saving clubs etc. We work with the students and the researchers through our process of analysing what the challenges are for a particular area with lots of engagement with the local councils and the representatives of various local organisations and we develop visions of potential futures based on distributed future solutions. We exhibit these visions and carry out more engagement with the community while they look at those visions. When I use the word “visions”, I literally mean “visions”; visual representations of the future designed by students, then on the basis of some degree of acceptance, of intrigue and perceived plausibility for those futures by the community. Then we present another round of design work; proposals for things that could happen now that are small enough, that they’re within the ability of the local communities to do but also experimental; small enough so if they fail that’s not a big disaster but experimental enough so if they succeed they can replace business-as-usual. This work coming out of eco-acupuncture projects gives us the backbone for some of the research projects that are within the university and more traditional research projects which cover mathematical modelling and scenario analysis to understand what is possible for Austalia’s future in terms of food. There is some work about researching the nature of current pathways by which communities access food and how that can be improved with the purpose of trying to intervene by setting up new experimental ways by which connections between producers of food and consumers of food can be made in a way that improves health outcomes and improves sustainability. All of this work in a sense comes together in a very new, big, national project, in fact the project that you’re the principal researcher of, which aims to engage communities, business, governmental organizations and researchers in thinking about possible 25-30 year futures for Australian cities as low carbon (in the current terminology) and resilient. It’s called Visions and Pathways 2040 and it’s a four-year project funded by Cooperative Research Centre Low-carbon Living. IG: VEIL carried some of its work at international level. Can you please explain some of these projects? CR: The work that we’ve done in precincts in Melbourne, in country towns and so on, in some ways are better known overseas than in Australia. We had lots of requests to present VEIL’s work to other universities from different places ranging from Asia to Europe. Finally, two years ago, the City of Florence came to us through a very strange and indirect way. Somebody had seen our work, mentioned it to the City of Florence and the City came to us explaining that they have a fundamental problem with the future of Florence. Florence is a UNESCO World Heritage Site and preserved in that way. It’s increasingly there simply for the gaze of 12-14 million tourists a year and yet it’s a city that is trying to exist in that partly artificial past in a slightly theme park way while environmental conditions, weather conditions in particular are changing dramatically. So we went to work with the City, we took a whole team and some European partners joined us to redesign possible futures of the City and presented ideas on how the future might unfold for Florence. When we went there it was the fourth or fifth year of a severe draught, summer temperatures went regularly over high 30s and frequently over 40 degrees. It’s a city that has no trees in public places none whatsoever, it’s a city in great danger from flash floods and in winter the conditions have deteriorated as well. So there was a very clear clash between the future viability of that UNESCO museum and future survival of Florence. We took a team of students to work there with the support we got from a philanthropic organization attached to the University of Melbourne and the Faculty of Architecture Building and Planning. We spent an intensive period of time working in the middle of the City, following the process of eco-acupuncture. There was lots of interaction with the residents and council representatives. Many of them were very challenged and surprised by some things which they thought should not be able to happen because they have an idea of fixity and preservation. We went back there with the students and the City itself as well as New York University Florence campus as partners. We furthered the work we started and produced a series of propositions the City should look at in particular; not blueprints of what they should do, but guides for how they might approach the future development of Florence. We have recently get into agreement with the City of Rotterdam in the Netherlands to carry out a similar eco-acupuncture project for Rotterdam starting from this year. The old Court House is the prototype site for a new network of reconditioned ‘Ghost building’ spaces, that all feature prominent retractable solar collection arrays or ‘solar flowers’. The Court House features creative studios, research and experimental facilities and an exchange space. Small start up companies can take advantage of the flexible studio spaces for developing new sustainable businesses. 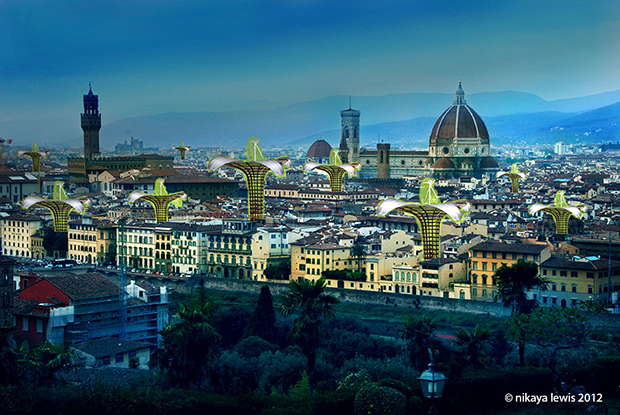 The Solar array ‘flowers’ provide energy and amenities for the host buildings and create a provocative addition to the heritage skyline of Florence. A functional and recreational wetland is constructed along the banks of the Arno in central Florence. The lifeless space of the Lungarno is transformed into an extended night and day leisure corridor with active riverbanks. This is designed to act as a flood mitigation strategy, provide water purification and easily accessible green space for Florentines. Sustainable bioremediation techniques are exhibited within the park and horticultural activities such as flower growing are featured. IG: The new project you mentioned earlier, that I’m working on, Visions and Pathways 2040, is a very important project for VEIL, bringing all the expertise accumulated in VEIL over the years of its existence, as well the current projects which are ongoing together, and it is a large project in terms of the partners and stakeholders involved. What would you like this project to achieve in Australia? CR: One quite simple thing -which is the same thing we achieved in eco-accupuncture projects and I think perhaps the most critical thing to achieve in this project as well, that it overcomes a sense within the community that the change beyond a small variation of business-as-usual is simply not possible, that perhaps the most problematic issue in terms of changes associated with climate change, in dealing with significant structural change is that most people think that change is not possible. There’re surveys which ask people what kind of future they want. People respond with wonderful, radically non-business-as-usual ideas. But when they’re asked what kind of future they think they will get, their response is present carry through to future. So there’s an increasing gap in that sense. In a way, through this project if we can move in to situations where we’re able to say “The future can change. It can change quite quickly and here’re some ways in which future might be very different than the present” and do that in a way that people, communities, businesses, service companies, built environment companies and so on can get ideas about alternative futures, then I think we can achieve a lot in terms of speeding up the change. The critical issue is, we know we need to make changes within a remarkably short period of time. We sit at the end of two hundred years of development based on fossil fuel consumption and we’ve got 25-50 years at the most to completely unpack that and replace it with something else. Nothing like that has been achieved before. So we need ways in which we can address and overcome areas of resistance. The simple answer to your question is: to have sufficient communication of alternative visions of futures. We’re already in the process of generating these; we’ve touched, had the input from, have engaged with many people but hopefully through this project we can widen the audience of our message and the visions created in this project can become intriguing senses of the futures and demonstrate future doesn’t have to be straight line continuation of present, that it can be dramatically different. IG: Chris, all of this is very exciting. I learned a lot about VEIL through our conversation and I am looking forward to actively take part in Visions and Pathways 2040 project as a researcher. Thank you for your time.